At BeA Alfresco we offer you a unique feature that you and your guests will love, our ‘Tableau de Mariage’. It is a French expression that means ‘wedding seating plan’. But we don’t present you with the customary white draped table with the name cards arranged on it that is typical of a lot of weddings in America: our Tableau de Mariage is a beautifully arranged tableau of cards with the names of the people sitting at each table artistically inscribed upon them. This arrangement is either encased in a while, silver or colored frame which can be coordinated with your table decorations, which will also harmonize for example with the colors of your vintage Tuscan wedding theme. This makes a beautiful addition to your dream wedding in Tuscany! The flower accents are so artistically arranged and turn what is normally a place where your guests simply stop to check for their table number into a place for them to linger and admire this stunning presentation. 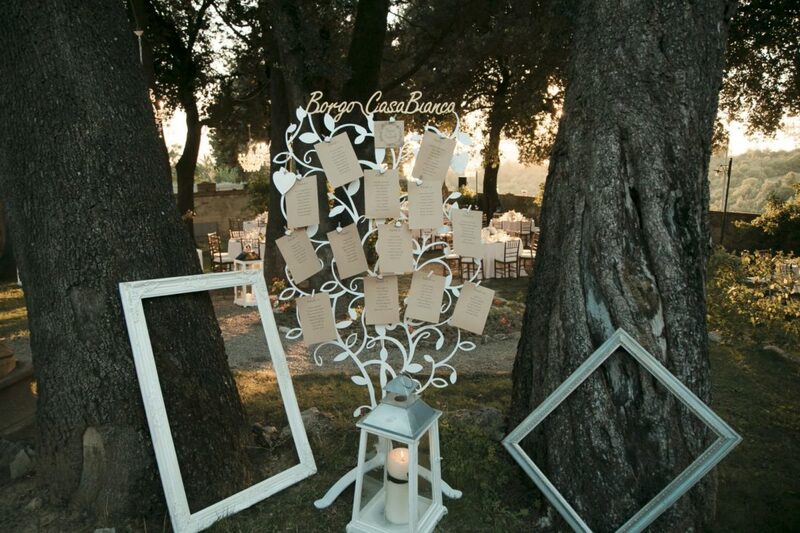 If you prefer, the individual place cards can be made from fabric and hung from the limbs of a native Tuscan tree, such as an olive tree, or a decorative arrangement of branches – both of which will be placed in an eye-catching container – to make a stunning addition to your reception or cocktail area. Once again, this will give you a unique way of presenting your guests with their table assignments at your dream wedding in Tuscany. We offer many different themes for your Tuscan wedding, from vintage to Bohemian and also fairytale or luxury – naturally the choice is yours – and we will assist you with every step along the way thanks to , with our vast range of experience. Whether your choice is a luxurious vintage wedding, or if you have more budget-friendly plans, all of us at BeA Alfresco will work with you to ensure that your dream wedding here in our beautiful Tuscany will indeed be a day which the bride and groom, along with their friends and family, will remember for the rest of their lives.